Spring is a season of new growth and renewal. We all have our own rites of Spring that help us celebrate the turn of the year and the prospect of summer. At home, we plant gardens, clean house, and replace the batteries in the smoke alarms. At large in America’s Finest City, we welcome old friends, try new things, nurture nature, and jump into food festival season! We don’t have any lingering snow to clear away around here, so we’re ready for the fun to start now! 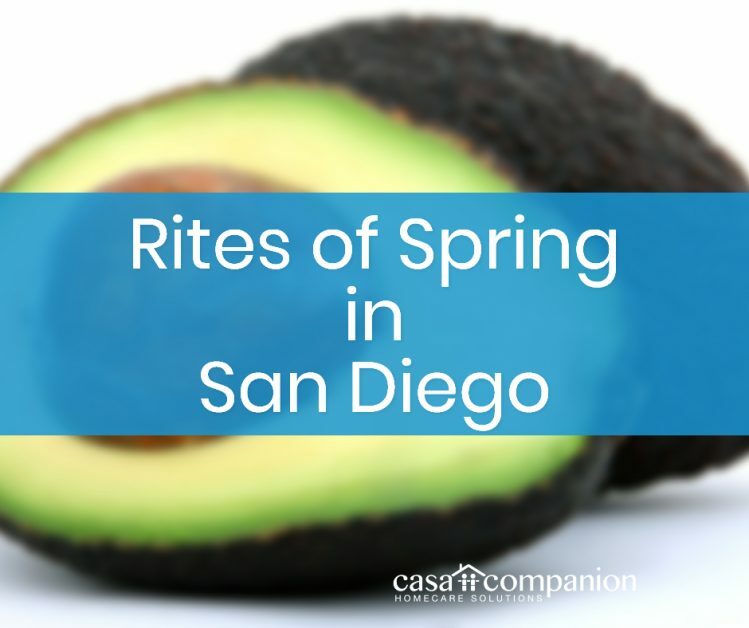 Caregivers in San Diego can celebrate the rites of the Southern California Spring this month with the Padres, the birds and fish, two fabulous local festivals, and more! San Diego Padres Opening Day! What you can expect: Today is Opening Day at Petco Park! According to the Petco Park Insider, the Padres’ home opener is “Thursday, March 28, at home at Petco Park against the San Francisco Giants. The first pitch will be hurled at 1:10pm – it’s a day game. It is the first game in a 4-game series, so enjoy the opening homestand at Petco Park. Best of all, there is a free hat giveaway!” Plus, it’s the regular season Padres debut of new slugger Manny Machado, acquired in the off-season from the Dodgers! Tickets: Tickets are sold out on the official Padres site, but SeatGeek has plenty of great choices. Tickets: It’s a free volunteer opportunity! What you can expect: Julian Gold Rush Days are two days of family-friendly old-timey fun! For the $3 admission, you can enjoy a Civil War re-enactment, gold panning & old-time laundry, toddler friendly “cornstruction”, square dance lessons and old-fashioned shows scheduled throughout the day. Pay-as-you-go or ‘passport’ fun includes archery, tomahawk throws, hayride tour around the farm, candle dipping, and gem mining at the Long Tom sluice box. Plus, arts & crafts and a beer garden! Tickets: Kids get in free! Adult (16+) admission is $3, and the activity bundle is $15.